Dowbergill: Ian and George Cummins, Steve Warren (11th November 2007). After such a fine couple of days last weekend, with Penyghent on Saturday, followed by an afternoon bouldering in Teesdale on Sunday, I was afraid that this weekend might have a touch of ’after the Lord Mayor’s Show’, but as things turned out we all had a memorable time. Upon my first sight of the steep flowstone cascade at the bottom end of Dowbergill passage, I was curious to investigate the fine grotto hidden at its summit. I was also rather wary of climbing it, noting an absence of anything particularly positive in view on the rippled calcite sheet. However, Steve assured me I would have no bother, as one of his mates had nipped up it years ago. Not feeling quite so sure, I packed a 9mm climbing rope and a collection of wires and Friends just in case. Despite not being particularly deep, the water in Dowbergill was really cold and I carried George on my back along the section of rift passage to the duck. We could almost have got George through the duck out of the water, with levels being pretty low, but he waded through and I pushed him up onto the top of the bulge at the base of the flowstone slope, tying him off to a solid Rock 10 in a fluting. Tying myself in, I surveyed the route ahead – first impressions were not good – wet, slightly muddy calcite, lacking any positive holds, combined with my blown-out 6 quid boots did not compare with Stealth rubber on gritstone! 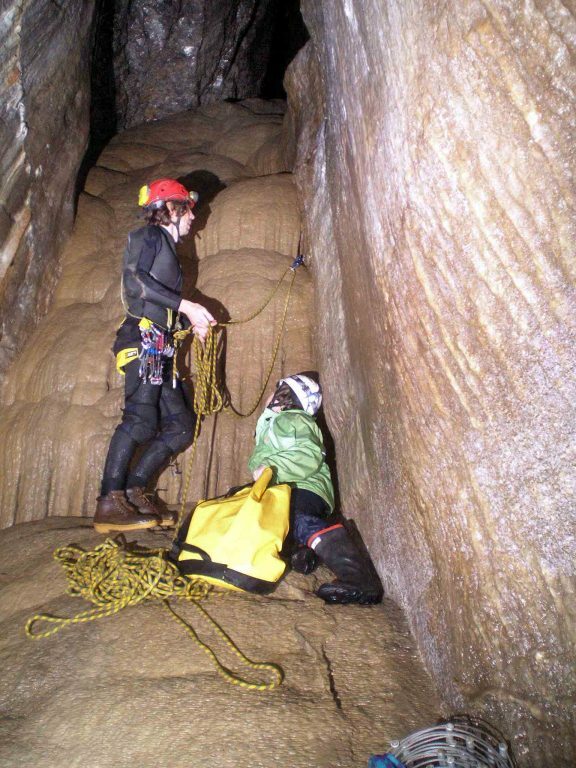 Proper Potholing 2. What we want is an Indian rope trick for Ian Cummins and George in Dowber Gill Passage. Steve recommended climbing the left side, but my feet would not grip and spying a slot a few feet higher on the right, I moved across a placed a solid Friend 3 runner. As George was now in the fallout zone, he was unclipped and had to wade along upstream to sit out of the water on a ledge. With Steve belaying in the stream below, I managed to climb above the protection, groping on the round bulges above for any kind of a hold, but only spying a short calcite thumb on the right wall. Pinching this, it seemed to be a decent hold and I placed a thin sling on it for more psychological protection to reach the apparent ‘ledge’ above. Except it wasn’t a ledge, only more sloping, gritty, slippery flowstone. The only good point of the situation was a small thread, into which I could get a finger and reaching down to the thumb, I lowered down to untie a sling to thread through, feeling that with this clipped, I could sprint up the less steep, but also rather mucky-looking final section to the tantalising hole above. Climbing back up, I managed to push one end of the rope through the thread and tried to use the ‘thumb’ for support to tie it in. Next thing I knew I hit the bulge on the stretch of the rope – well held Steve – with the threading rope in my left hand and the calcite thumb in my right! As Steve was turning into an icicle and a stoical George was also a bit chilly, I beat a slightly bruised retreat, again carrying George along the wet rift, to the accompaniment of Steve’s echoing arias. Hats off to anyone who has climbed up there! Grange Rigg Pot: Ian Cummins, Simon Beck. After a cuppa in Steve’s van, George and I drove over to Ingleton to buy new kneepads and our second breakfast of the day. Approaching Ribblehead, I saw a familiar Skoda doing a U-turn in the road and flagged down Simon, en-route to a solo of Roger Kirk Cave and we agreed to meet up to do Grange Rigg the next day. After a cuppa in the café and a chat with The Birketts and Chris Plant on Sunday morning, I drove to Clapham to meet Simon and elected to walk up in non-caving attire to allow a walk back in dry, warm clothes, the evening promising to be clear and very cold. We found the entrance first go, it being very close to the CPC shuttered dig, with its amazing perpetual motion bucket contraption – what it does, I don’t know, but it kept us amused for a few minutes. After changing in the sinkhole and stashing the bags inside the entrance, we were ready for this fine, varied trip, which I can fully recommend for its dry, yet gloomy first pitch, some pleasant, shorter, wet descents and some absolutely stunning formations in the chambers below the Christmas Pot inlet. In fact, if combined with an exchange to Pay Sank, this outing would tick almost all the boxes for the perfect cave trip. Pleasant stream caving leads, after the fourth pitch, to a low, narrow crawl in the stream bed, or a crawl in the top of the passage above. We took this obvious high-level route, dropping back down into the stream after a not-too strenuous negotiation of this section and also climbed up into the Christmas Pot inlet for a look. Below this one encounters the finely-decorated chambers. A trip even to here would be well worthwhile and not particularly difficult – we certainly took our time to enjoy the brilliant white delights on display here. 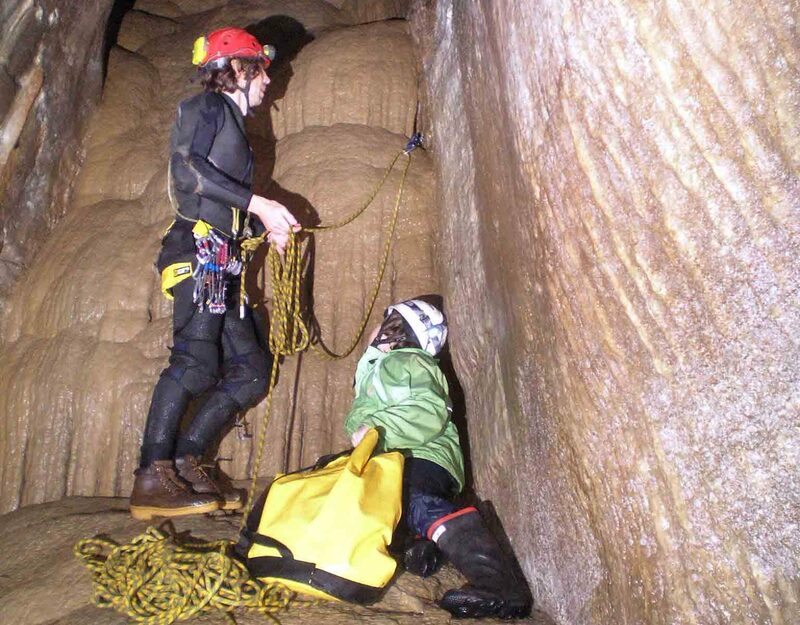 The final section to the sump and the connection above to Pay Sank is rather more serious however, with a squeeze down a hole past a rather precarious-looking stemple, leading to a further tricky move to pass a block and enter the tight, wet Drainpipe. Exiting this aqueous feature soon brings the sump pool chamber in view and we both slid down the mud slope to have a dip. Reversing the move past the block up to the stemple proved to be awkward, but feeling fresh on the return, I elected to try the stream-level route below the Anemolite Crawl – big mistake! This was one of those sections of passage that you feel must get better soon, but actually gets worse, being flat out, body-width, over a rubbly base, with the cobbles wedging at one’s waist and requiring excavation ahead. After about 10 minutes of this, I finally admitted defeat, encountering a cobble blockage ahead that I could not find the energy to clear. Going into reverse was very hard work and Simon had to pull at my feet when I was wedged by the cobbles building up around my waist. Needless to say, the roof traverse felt like a walk in the park, but such was the expenditure of energy in the horror below, that the route to the surface was pretty hard work. Surprisingly we emerged with the last vestiges of sunlight allowing a swift, chilly change, although the hot aches in my hands lasted until we were below Trow Gill. Another great weekend and if anyone wishes to do the exchange trip, I’d be very keen.